Lynnanne has dedicated 25 years to the instruction, preservation, research and performance of multi-cultural dance and heritage. She was a performer and choreographer for Westwind in the 1980s, before joining AMAN Folk Ensemble as a performer and teacher in the 1990's. She is currently a Teaching Artist in schools throughout the L.A. area, and runs a youth and family dance series at a studio in Altadena, CA. 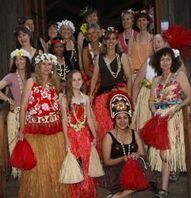 Lynnanne's 2011 Polynesian Class at Folklore Camp during the class performance. 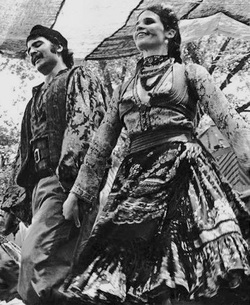 Linda DeNike started dancing as a child, and danced professionally for almost 30 years with groups such as the AMAN International Folk Ensemble, Celtic Dance & Music Show, Renaissance and Dicken’s Faires and Patty Farber’s Baba Ganoush Dance Troupe. 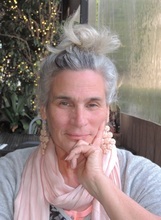 Linda is classically trained in ballet and competitive Scottish Highland Dance, and is a student and teacher of Meditation & Healing, Yoga, Qigong and Tai Chi. 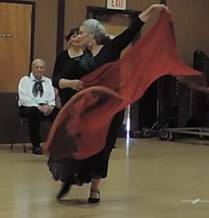 After a 25 year break from dance, she now works with senior dance enthusiast in the San Francisco Bay Area teaching classes in Folk Dance and Dance Basics. Her classes are focused on developing and maintaining the flexibility, strength and agility needed not only for dance but for daily life as well. Nothing is more rewarding and self-satisfying than having a strong, agile body and being able to express oneself through the joy of movement. She says that is her motivation for dancing and teaching once again. 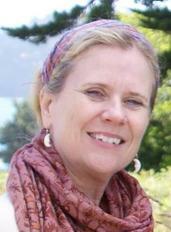 Linda’s Stretch, Alignment and Folk Movement warm-up classes will begin each morning at 8:15am for 40 minutes. 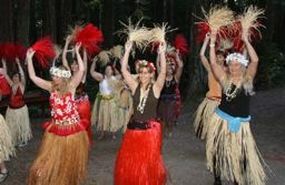 Nice example of a Sacred Circle Dance being performed onstage. Billy grew up in the Folk Dance world. He danced in his mom's classes at age 5, then by age 15 was dancing with Madelynne Greene's Folkldance group in San Francisco. He became a professional dancer at 19 and toured the United States and Canada with the Don Cossack Choir. In 1970 he moved to Los Angeles and joined the AMAN International Folk Ensemble, and was the original director of the chamber group ("small group") that toured schools throughout Los Angeles doing shows and in-service workshops. Billy was also the first recipient of the AMAN Scholarship to study dance over seas and spent a summer in the former Yugoslavia at festivals and workshops. After several years he retired from AMAN and started his work with young people in the Los Angeles Unified School District. For the last 37 years, Billy has taught traditional dance to middle school students, and directed his youth performing group "TANZA", who's danced at folk events throughout California. Billy has taught at many Folk Dance Camps & Festivals throughout the United States, and most major universities on the West Coast and several on the East Coast. 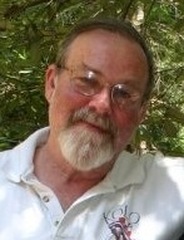 He is a long-time Mendocino Folklore Camp attendee, director and historian. 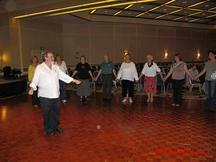 Nice example of a "CALLED" Salsa Rueda de Casino dance circle.